You play as Tamagon, a little dragon lost in the mazes of Devil World. The Devil stands at the top of the screen and points his fingers to change the direction the screen scrolls, trying to crush Tamagon against the maze walls. The Devils cohorts, Medaman, Co-Devil and Bon-Bon, appear to attack Tamagon. 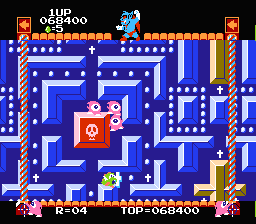 Tamagon must collect all of the Boa-Boa Dots, and then push Bibles into the Devil Caves to chase away the Devil and progress to the next stage. The game can also be played simultaneously with a second player controlling a red Tamagon. There are 16 rounds (46 scenes) that become more difficult as you play. After Round 16, you will continue to play but the game won't become more difficult. The Boa-Boa dots that supply Devil World with its magic lie on the paths of the maze while the Devil's cohorts walk around hunting for Tamagon. Destroy all the Boa-Boa dots. Collect a Cross by walking over a Cross Marker. Destroy the Boa-Boa dots by walking over them while carrying a Cross. Use the Cross to breathe fire on enemies. When its power weakens, the Cross will flash and then disappear. The stage is cleared when all dots have been destroyed (in some cases you will clear the stage even with 2-3 dots remaining). The Devil Caves open in the center of the maze. Grab the four Bibles from the edge of the maze and place one in each of the Devil Caves. Harder enemies will appear this time. Make your way to one of the Bibles and collect it. While carrying the Bible, Tamagon can attack enemies by breathing fire. Carry the Bible to the Devil Machine in the center and place it in one of the four openings to seal it. Once all four Devil Caves have been sealed, the stage is cleared and the Devil escapes to the next round. A timed bonus round. Collect as many Bonus Boxes as you can before the time runs out. There are 6 bonus boxes. 5 will give you a different number of points, while one contains an Egg, giving you an extra life. Stepping on an arrow on the path scrolls the screen in that direction. If Tamagon is crushed by the walls in this scene, he does not lose a life. 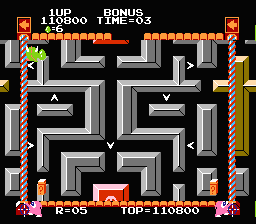 The bonus scene ends when the timer runs out or Tamagon is crushed by the walls. You then move on to the first scene of the next round. A dragon who has become lost in Devil World. When Tamagon holds a Cross or a Bible he is able to breathe fire to defeat the Devil's monsters. Tamagon's name is a combination of the Japanese word Tamago (egg) and Dragon. In the 2 Player Game, the second player controls a red Tamagon. King of the Devil World. He appears at the top of the screen, directing the scrolling of the maze by pointing his fingers. He gets his magic from the Boa-Boa Dots and the Devil Caves, so Tamagon has to destroy these obstacles if he is to defeat the Devil. At the end of scene 2 in each round, the Devil transforms into a bat and escapes to the next round. A pink-bodied creature with one large eye, and the most numerous of the Devil's cohorts. If you can breathe fire on Medaman he will turn into a Fried Egg, which Tamagon can eat for points. The Devil's lead cohorts are a little blue devil with one eye and one horn. If you breathe fire on them they will freeze in place for a moment and then change direction. He appears on Round 2. A fast little creature with a brown body and a large orange eye. He appears from Round 7 and acts like a faster version of Medaman. Hit him with fire to turn him into a Fried Egg. The source of magic in Devil World that appear in the first scene of each round. Tamagon can only destroy the Boa-Boa Dots while holding a Cross and running over them. Once all of the Boa-Boa have been destroyed, scene 1 is complete. Each Boa-Boa is worth 100 Points. An important item that appears in the first scene of each round. While holding a Cross, Tamagon can not only destroy the Boa-Boa dots, but also breathe fire to defeat the Devil's monsters. Each Cross only has limited power, and it will eventually flash and disappear. 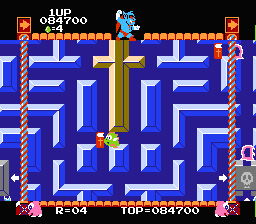 In scene 2 of each round, Tamagon has to collect the four Bibles from the corners of the screen and use them to fill the Devil Holes in the Devil Cave in the center of the maze. While holding a Bible Tamagon is able to breathe fire, and its power doesn't diminish. Collecting a Bible is worth 1000 Points, and sealing a Devil Hole with a Bible awards another 1000 Points. A delicious snack that appears when Tamagon shoots fire at Medaman. If Tamagon eats the Fried Egg, Medaman won't be able to appear straight away. The Fried Egg is worth 500 Points. Tamagon's favorite treat. 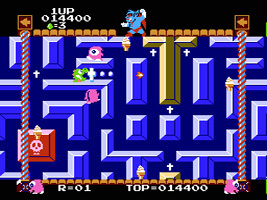 Four Ice Cream Cones will occasionally appear in the corners of the screen during scenes 1 and 2 and move around the edge. Each Ice Cream Cone is worth 800 Points. During the bonus scene, six Bonus Boxes will appear. Open as many as you can within the time limit. Only one of them contains an Egg. A mysterious Egg hidden inside one of the Bonus Boxes. It rewards Tamagon with an extra life (1UP).